The House Tour: The Study – Uniquely Yours… or Mine! We just finished painting it, Benjamin Moore Museum Piece, and hanging the picture rail. This is the second room we’ve added a picture rail to and I just love it! 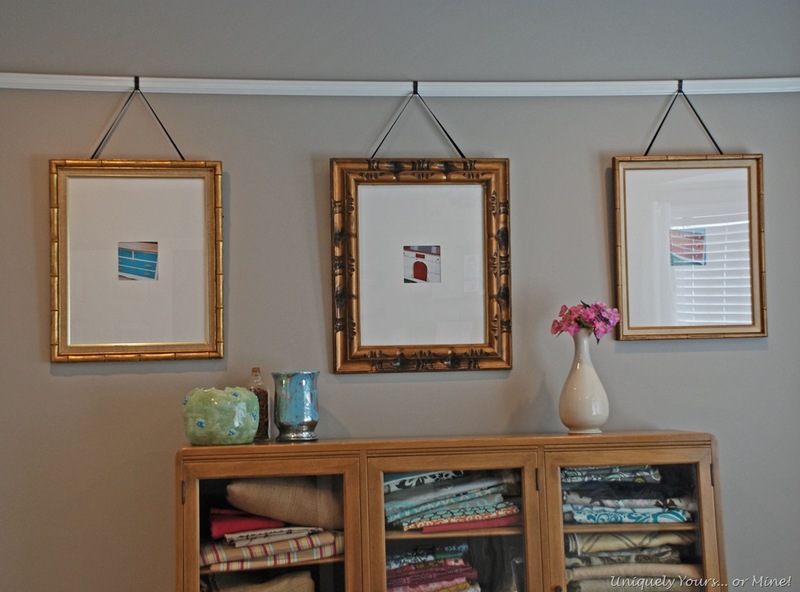 You buy these special hooks that sit on the rail and you can move and hang pictures all over the space, plus I like the added architectural feel that it brings to the room. I recently bought a HUGE collection of vintage frames, I was totally excited! I cleaned a few of them up, added glass and mat board and some close up pictures of furniture I have refinished. I just love having these up as inspiration photos and as a bonus it ads a little “art” to the space without being over personal… remember I’m selling the house so they needed to be neutral pieces. 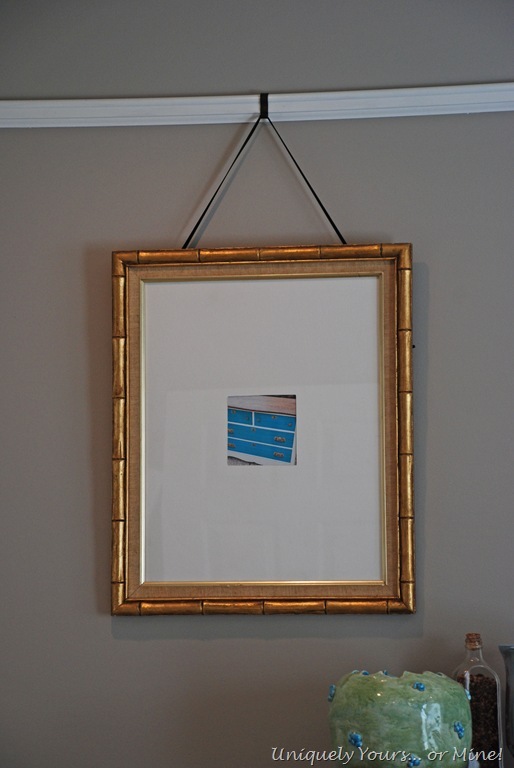 I used black velvet ribbon to hang the frames with, just tying it to the back hooks. 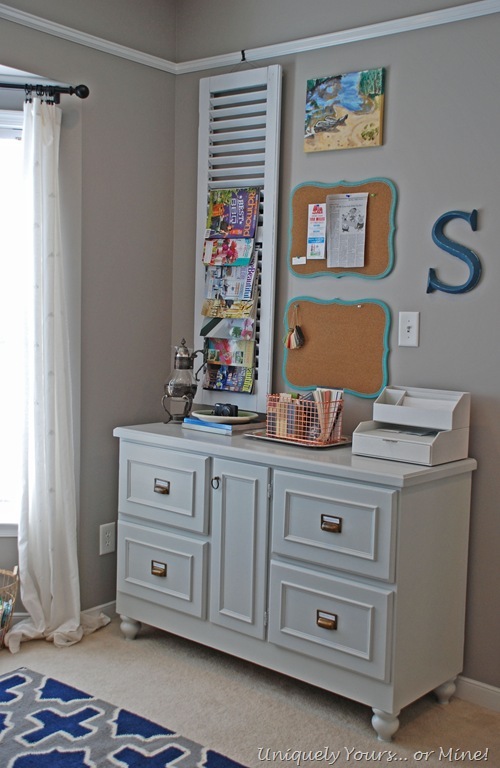 This room can either be a bedroom or an office as there are nice deep closets in the room as well. 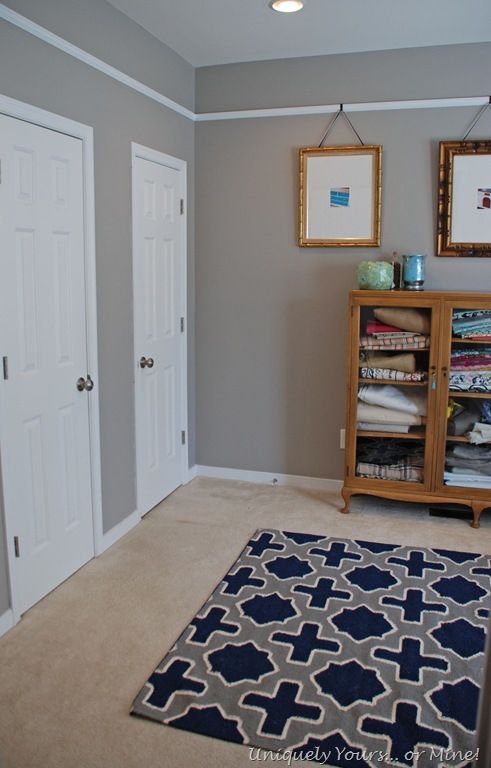 I use the closets to store my crafting supplies, sewing machine, printer and Silhouette machine… it keeps the room nice and tidy looking and my “goodies’” away from the kids. The room has a beautiful bay window that is a perfect spot for my vintage desk and chair. Lots of morning light and a pretty view of the woods out one of the windows. 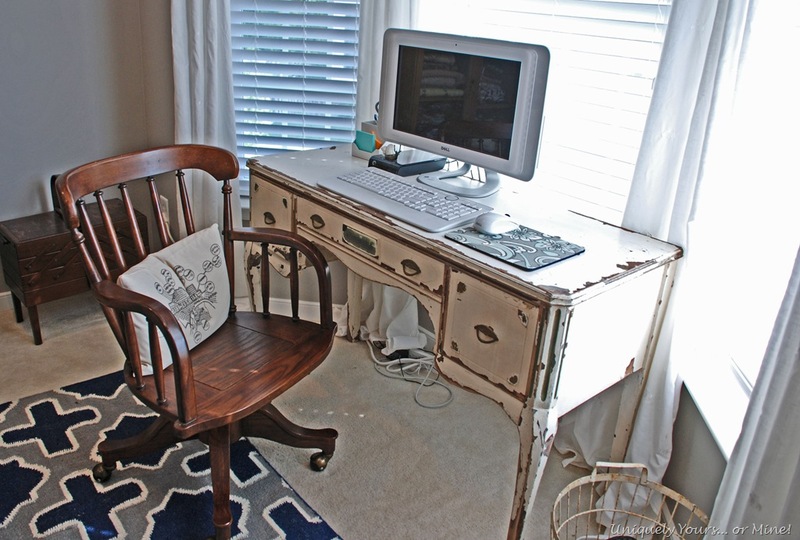 I just adore my vintage desk and chair, the finishes are original all I did was clean them up, super easy! 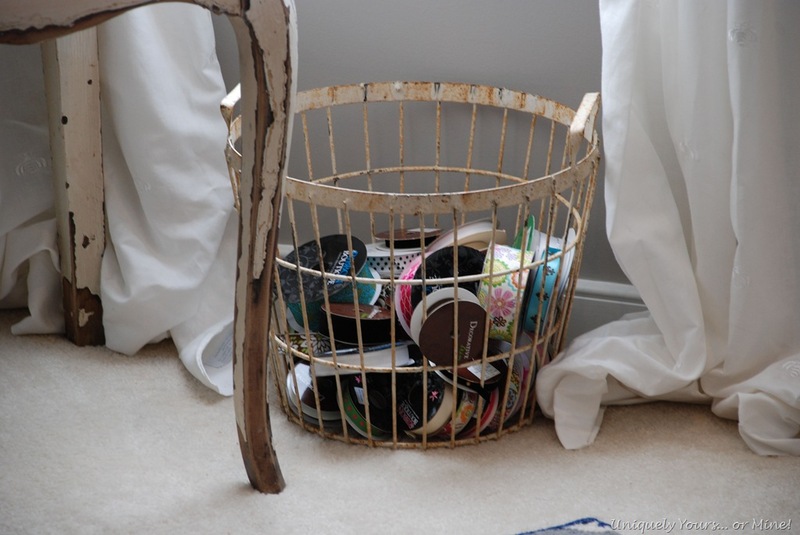 I’m using my antique basket to hold all of my ribbons, I don’t use ribbon that much but I love buying it… so many pretty patterns! I did seal the basket with poly before I used it, that way it will continue to have this great patina but be safe for my carpet and ribbons. This is my “command” center area with lots of space for home files and my business “stuff”. I’m working on the post for the credenza, you won’t believe the transformation! 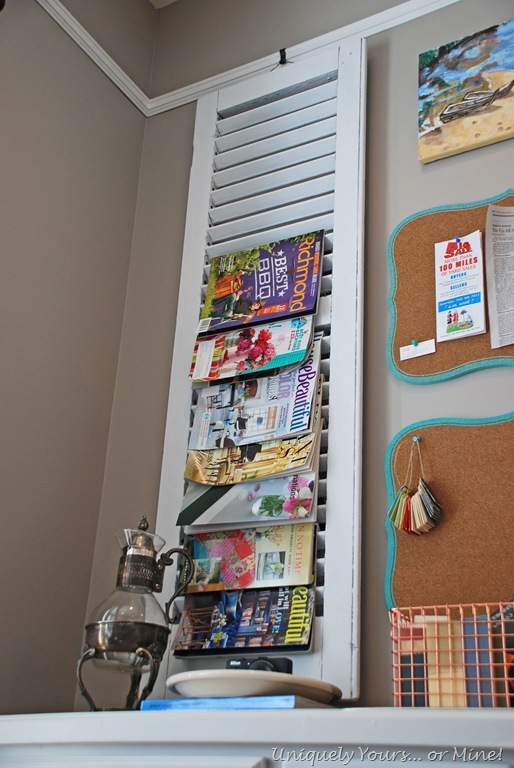 I had this vintage wood shutter leftover from Lucketts so I asked my SAH to remove every other slat so I could use it for book and magazine storage. I just spray painted it white, because it was fast and easy, but I hot glued 1” cork “feet” to the top and bottom of the shutter so that it would sit off the wall and allow the magazines to slip over the rungs. I hope you like my study! Now that it looks fabulous I hate to have to leave it… but I hope someone else will love this room as much as I do. Thanks Kathy! 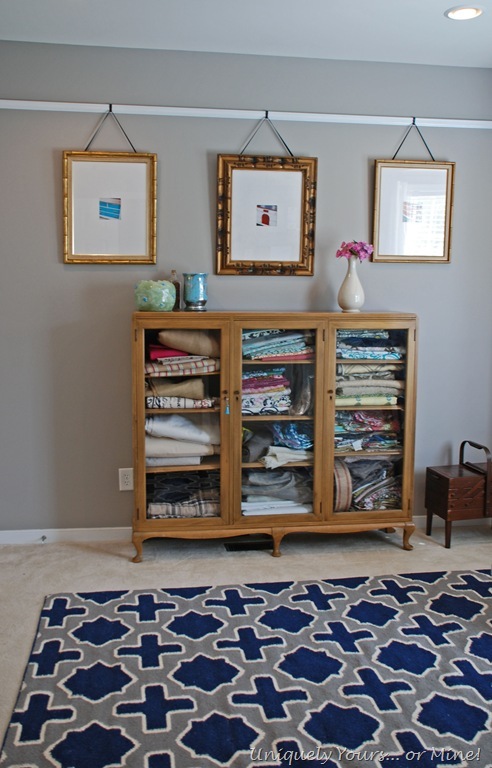 I just love having it organized, if only until we move, it still makes me smile when I walk by… Super easy changes too! Good luck with your move and staging! 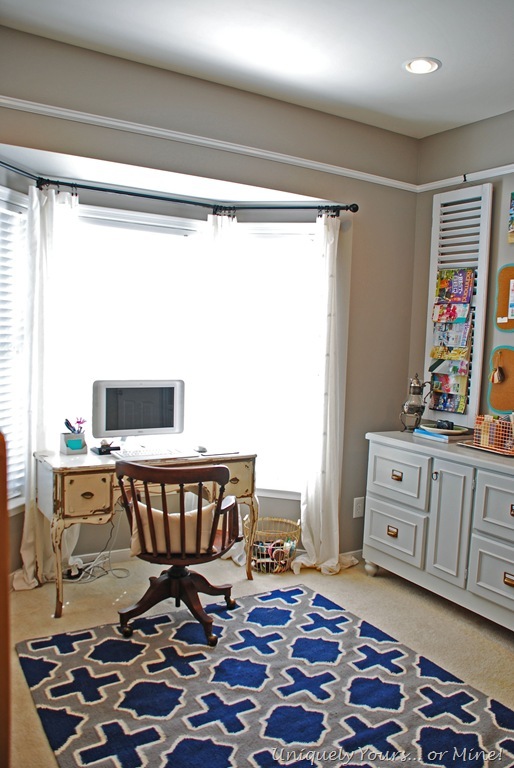 That desk is just gorgeous Susan – and I’m loving that carpet way too much – what a great space to create in!!! You’ve inspired me to go de-clutter my office! Thanks Deb! Now maybe I should send you a picture of my cleaned out garage 😉 seriously hard to let some of the unfinished pieces go but I’m hoping Louisville will have some great finds! Wow, that is some room! 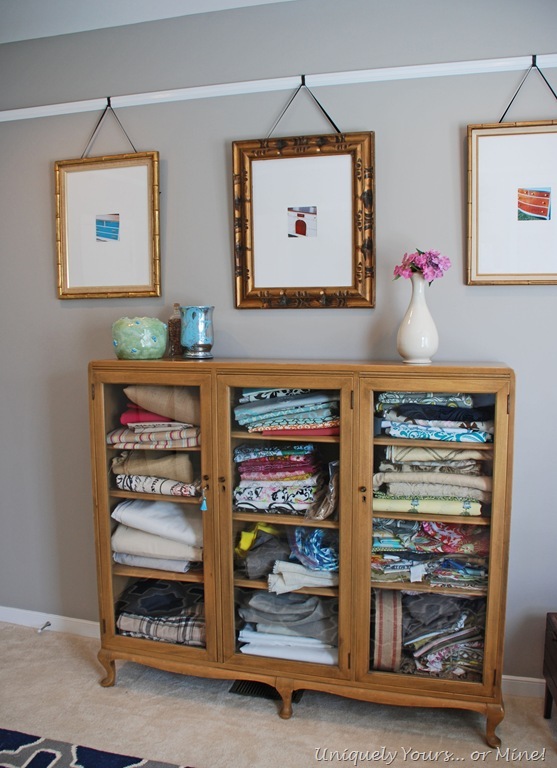 Love the cabinet filled with fabrics. Can’t wait to see the rest of your rooms! Pingback: My New Credenza | Uniquely Yours... or Mine! Great job on the overall design! I love the wall colors and the rug. Could you tell me where the carpet is from? 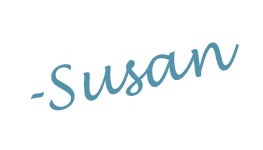 Thanks Vanessa! I bought the rug from Joss & Main.